Fun addition to the site today, it's a Marvel comics brochure from 1982 that details their service of providing Superheroes to your next event. Want Spider-man, Destro and ROM: Space Knight to visit your mall? This is the sales kit you'd recieve and it's pages of fun shots of actors dressed as Marvel Superheroes and some iconic toy characters from the past. If anyone has childhood pics of a mall visit such as this, I want them! Send them to me and I'll send you a prize pack. 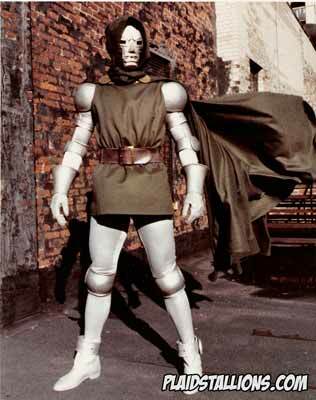 This may be a Mall costume but I like it better than the recent movie doom. 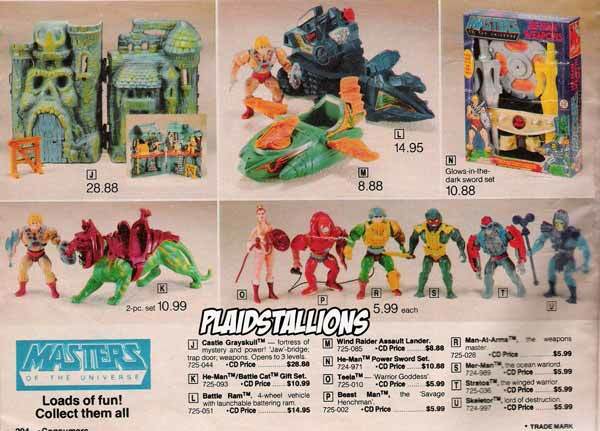 Masters of the Universe was another toy line that caught my eye during this time. It's bright colors and simple themes reminded me of a simplier time (pretty amazing considering I was 12 at the time). Castle Greyskull is also one of the best done playsets I have ever seen. Although I closet watched the series on Saturdays, it was after all filmation, even I knew I was too old to buy the figures. I think that made me mad, that is until I discovered girls and teen drama. 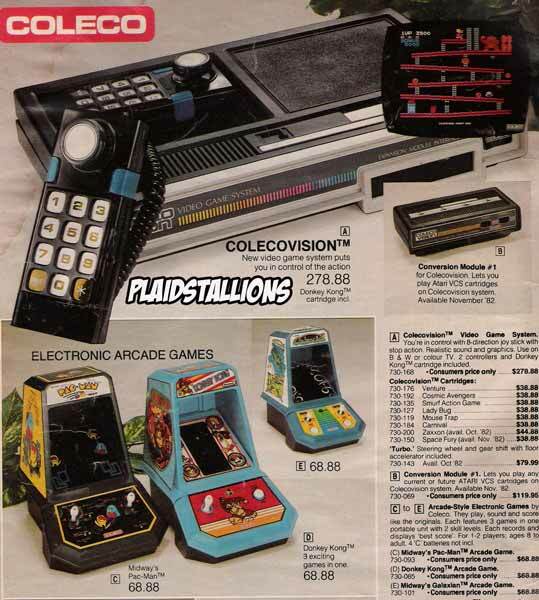 Those table top arcade games by Coleco that inspired hours of drooling for me. 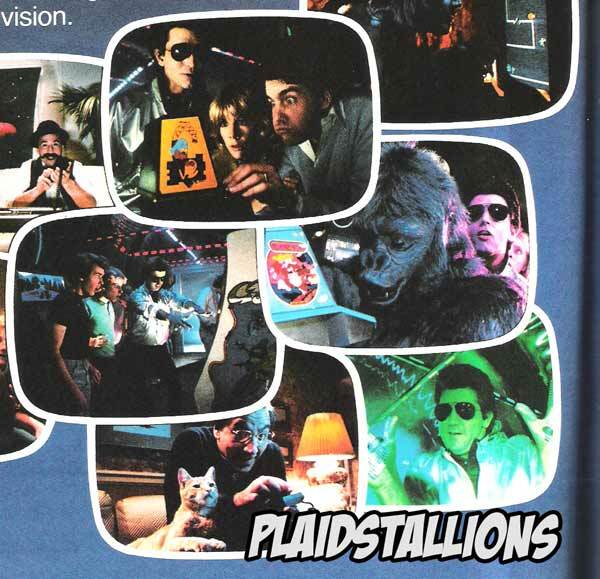 I remember really liking the commercials featuring "Video Man", who would use his powers to shrink the arcade games to table top size. 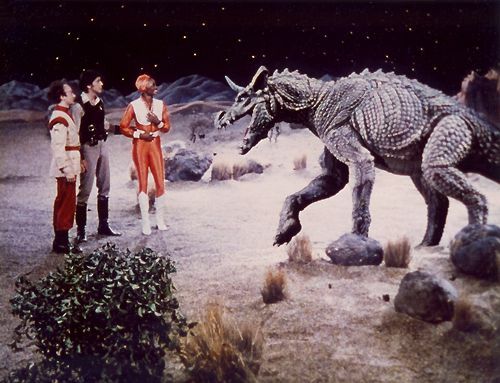 I've been meaning to do more 70's DVD reviews for the site but never find the time, so today I did a quick review of the classic kids series Jason of Star Command. If you want it in a nutshell, I loved it, otherwise click here. 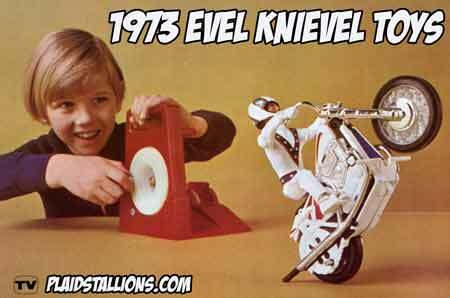 Today we journey back to 1973 to witness the birth of one of the hottest toys of the 1970's the Ideal Evel Knievel line! 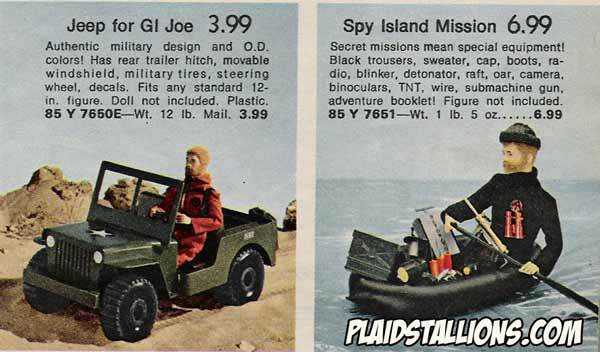 If you you were a child in the mid seventies there was no way you weren't aware of this toy. I'm a self professed Martial Arts nut but isn't wearing a simulated Gi with Bruce Lee's picture on it pretty much like an adult verson of underoos? Not that I'm judging, if they made adult underoos, I'd be a one man Justice League. It seems even the dress alike twins can't contain their dislike for the "Aztec" sweater, talk about people in glass houses! 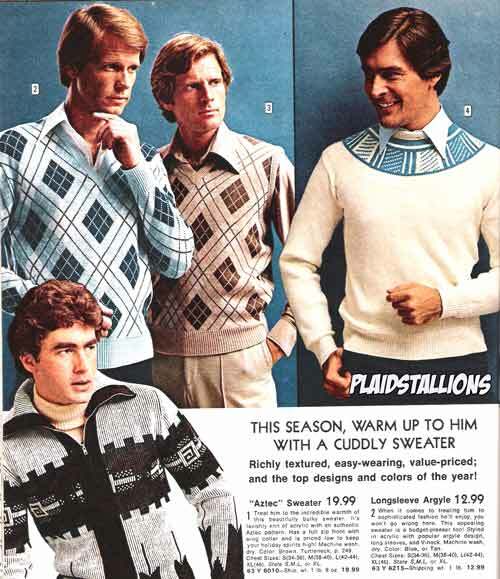 Is it just me or does the Aztec sweater remind anyone else of Ozymandias from the Watchmen? 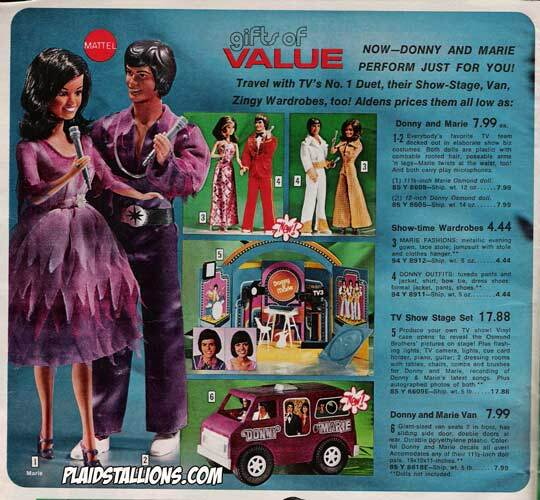 I admit it, I had a Donny Osmond doll. 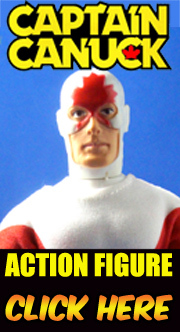 Even worse was that I chose him during the annual family March break shopping trip to the Scarborough Town Center, passing over the Mego Human Torch doll i had coveted for so long. All of this was done to impress my older sister who remarked how cool the Osmond toys were. The reality kicked in during the ride home when I realised I was now the proud owner of a Donny Osmond doll. I'd like to go back in time and stop myself. 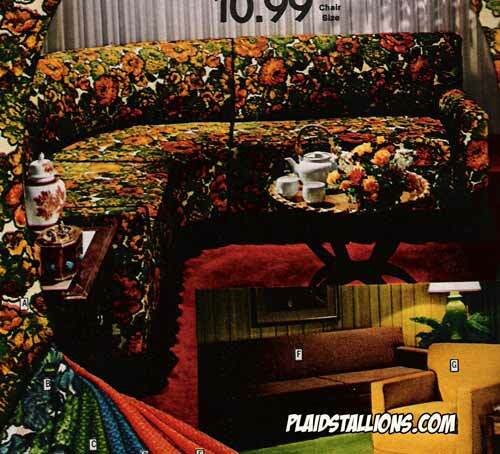 Is your couch a boring, almost tasteful affair? Not anymore with these fabulous slip covers. That's better! Why Does the Hulk Need a Helicopter? 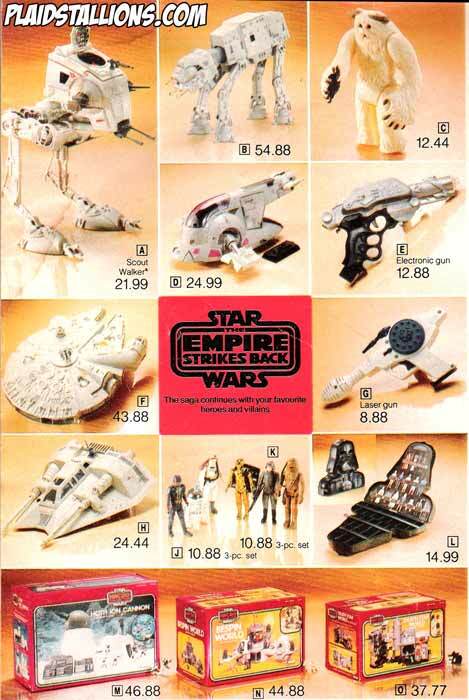 Today's site update is the 1979 Empire Toys Catalog. 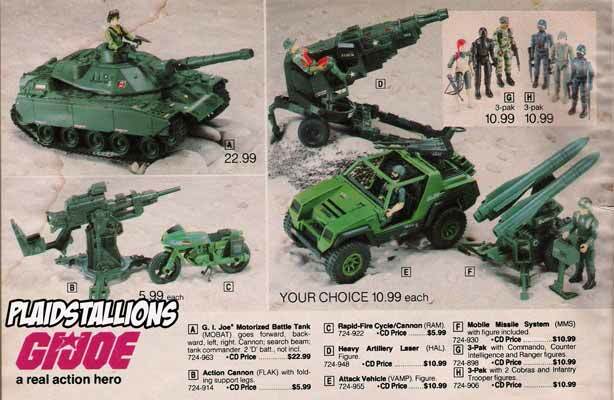 Empire didn't make many trendsetting toys, mostly items to fit in with other companies existing lines and using a lot of licenses. Superman, Spider-man and the Incredible Hulk get a lot of face time here. My grandmother had one of these back in the day, thank you Miss Mary of Sweden! I don't think Hasbro ever stopped making this set, it's always in parts lots. 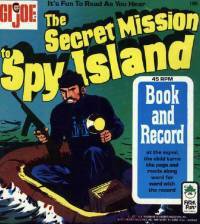 It was so popular that Power Records made a book and record set about it. I had the record as a kid, it was pretty darn terrific! How far we've come in my lifetime, here we have the Barbie's "Friend Ship" play set. What's Barbie's role on her plane? Stewardess. Something tells me that Ken would be serving the coffee if this play set were released now. Mattel recycled this into a Killer play set for Big Jim, I believe Big Josh was the flight attendant on that one. This one's kind of personal to me, seeing as my mom seemed to do most of her Christmas shopping with her Eaton's Card. Three years after they stopped making Wishbooks, Eaton's department stores made this cool newspaper circular that featured the hot toys of the time. 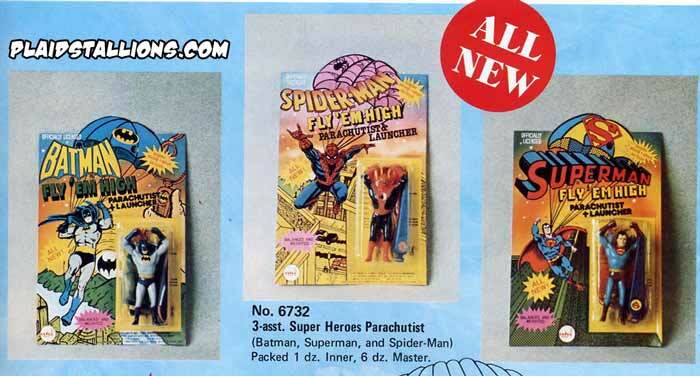 From Muppets to Micronauts, Star Wars to Green Machines, the 1979 Eaton's Toy Flier is one fun time warp. I'll try and struggle through the Catalog copy here, "Never before have females had a more flattering, graceful and leggier look". Flattering is questionable, leggier is sort of a given but graceful? That's like using "Pixie like" to describe Shirley Hemphill. You could hide children in those things. "Well I couldn't find a sitter so my daughter is sleeping in my Palazzo's"
Belly Shirt for her, good idea. Matching belly shirt for you? Awful and emasculating, you might as well have an oversized lolly pop in your hand. 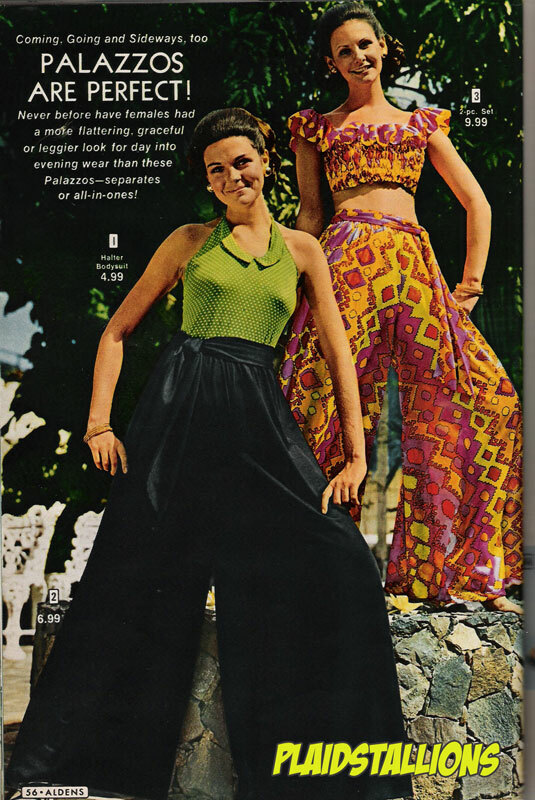 Nothing like waterproof outfits with great "hip huggin' flares for the beach" but wait there's more! That's so you can reveal "Bold Bikinis for both of you" Be a show off with sleek and comfortable Antron Nylon. 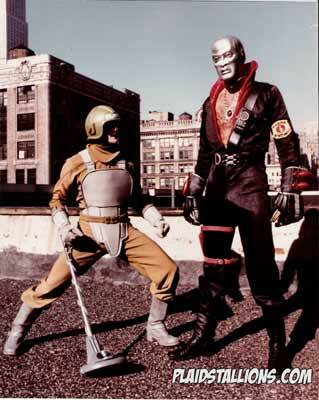 Wasn't Antron a bad guy in the Micronauts? 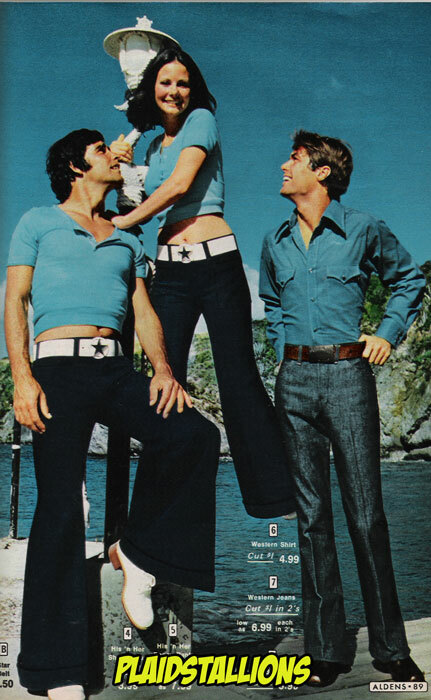 And that means it's time for the first ever Summer outfit week on Plaidstallions, spotlighting the only the greatest beach wear ever. This was made possible by my awesome find of Spring and Summer Catalogs at a flea market on the way home from Megomeet. The pic above is an interesting twist on dress-alikes, because of the matching suits I feel like the guy is cheating on his wife! A new and hopefully growing featuring to Plaidstallions will be the world of rack toys, which features the memorable lower priced toys from companies such as AHI, Fleetwood and Empire. If you've got something I don't have please drop me a line, I'd love to add it. Click the pics to visit. uh, why does Superman need a parachute?